"People keep telling me it should be easy as the writer of Princess Pumpalot but I keep telling them, it's one thing writing a play, it's a completely different thing learning the script, rehearsing and performing it in 48 hours", said Robin. Princess Pumpalot: The Farting Princess returns to the Edinburgh Festival Fringe for a fourth consecutive year in a brand new show, Princess Pumpalot: The Radio Show – Live on Stage! Performed in the style of a radio play and based on characters from Robin's successful children's book, this fast paced, fun packed show is for all the family. "The first show has come and gone and although at times we were sailing close to the wind, I must say I really enjoyed it", said Robin. "I might consider doing it again but perhaps next time with more notice". The show features Julie Heatherill as Princess Pumpalot, David Mairs as Guffy and Robin Mitchell (belatedly) as Cookie Crumble. 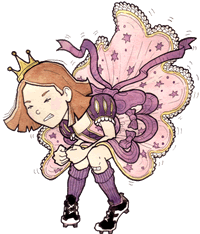 Princess Pumpalot: The Radio Show – Live on Stage! at Sweet Venues, 11.30am, until 21st August.